Seeing your company data fall into the wrong hands is a nightmare scenario for many businesses, yet this is becoming increasingly likely these days, precisely because of mobile access to cloud solutions. Traditional methods, focusing on users themselves, may have been perfectly adequate for desktop computers, but they make no allowance for the type of device used, or the application in question. In other words, they are completely inappropriate for mobile devices. This goes some way to explaining why many businesses are still reluctant to rely on cloud-based solutions, but there are answers to this problem if you know where to look. MobileIron offers MobileIron Access, which uses smart guidelines to prevent unauthorized end devices, users, and apps connecting to enterprise cloud services. At the same time, MobileIron Access also ensures that you no longer need to enter user data thanks to a seamless, single sign-on in secure environments. If a business opts for a cloud solution (learn more about cloud solutions here), the relevant software is hosted by a service provider and used by the business as a web-based service. Implementing and managing the selected solution, to say nothing of security and maintenance issues, immediately become the service provider’s concern, as well as ensuring that the software operates perfectly with an outstanding level of service. This is a huge benefit for businesses, but it comes with one proviso – that these solutions can be accessed securely. To reduce the risk of data theft, the aim is to prevent unauthorized devices, users, and apps accessing the enterprise cloud. Which is precisely where MobileIron Access comes in. MobileIron Access ensures that only verified users, using verified and compliant end devices, and approved apps, are able to connect to business data and services. Say a registered user downloads the Salesforce app from the Enterprise App Store and wants to access it from their company smartphone, they can connect to the platform without a password by using single sign-on (SSO). On the other hand, if they try to access the app from their private tablet, access will be denied or limited, as although their user data will be valid, the end device used will not have been authenticated and secured to the same level. MobileIron Access offers users impressive added value in the form of its new seamless single sign-on function. This function can be used with all apps that support seamless single sign-on. It saves users the hassle of entering user data, as long as they are operating in a designated secure environment with approved software and hardware. MobileIron Access also works alongside MobileIron Authenticator to guarantee extremely high security standards for user accounts. 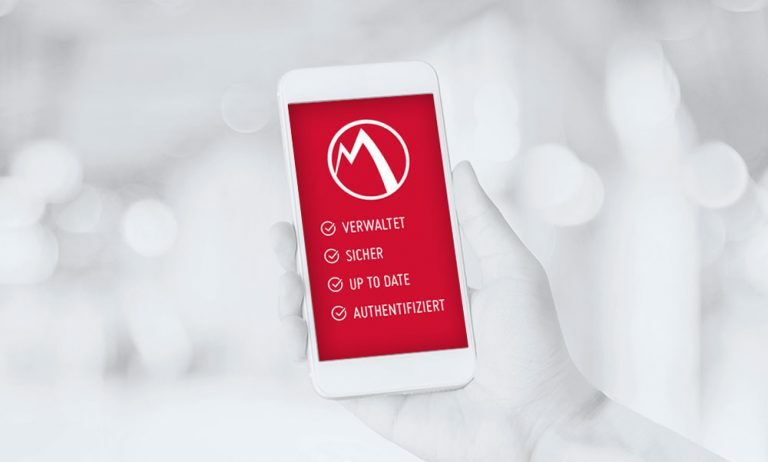 The MobileIron Authenticator app ensures that multifactor authentication is required for certain platforms, as defined previously in the UEM portal. In other words, users enter their user name and password when logging in and this log-in process must then be verified by their mobile device, which is managed by MobileIron. In short, this identity check uses not just one, but two factors for extra security. MobileIron Access also supports the use of additional user context information by incorporating the user’s location in the access control process, for example. In simple terms, this means multifactor authentication is only used when the user is outside the company network. Seamless single sign-on can be used otherwise – without the need for a password. Keen to know more about Cloud solutions and MobileIron Access? Just get in touch!